^ Morton J. Kiwifruit: Actinidia deliciosa In: Fruits of Warm Climates, 1987. Center for New Crops & Plant Products at Purdue University. 2011 [2014-04-08]. 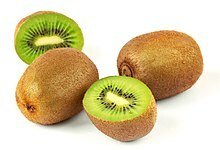 ^ Kiwi fruit: World List, 2010. FAOSTAT. [2013-01-04].